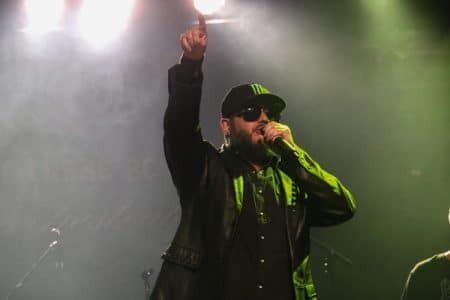 Former Judas Priest lead vocalist Tim “Ripper” Owens was recently interviewed by Sleaze Roxx writer Ruben Mosqueda for KNAC and was asked about people not wanting to buy a record because a band is not touring behind it. Mosqueda pointed out that KXM consisting of George Lynch (Dokken, Lynch Mob), dUg Pinnick (King’s X) and Ray Luzier (Korn, David Lee Roth) kind of shattered that myth. Owens replied (with slight edits): “Let me tell you my feeling on this thing, because you know there’s people that know everything music out there that are always offering me tips on how to run my career! [laughs] They’re like, “Tim you need to be in one band”. Well, if I were in one band, I would be working a 9 to 5 job 50 hours a week to pay my bills! [laughs] I’m a musician, this is ‘my job’. So if I was a fan of music or of George Lynch, dUg Pinnick, I’d want to get all of their stuff! If Rob Halford put out a solo record, a Fight record or a Judas Priest record, I’d be all over those records! Why? Well, because I’m a fan. Spirits of Fire was an idea by our label Frontiers [Records], with Chris Caffery who I have been friends with forever. We look forward to getting this album out and doing some shows. I would love to get a song or two from this album into my setlist, I would really love to get a song in my solo setlist. We already want to get to work on another record. We had so much fun working on this record. We had Roy Z produce it and we want to do another one because I think we know what potential we have after making this record. We know what works and what doesn’t work, what songs, what styles, all that stuff. The record sounds like Judas Priest meets Savatage, and I love it! The goal is to do some touring, we all have other things going on at the same time, but we’d love to tour. You can read the rest of the interview with Tim “Ripper” Owens at KNAC‘s website.